Does High Education Pay Off for People with Dyslexia? 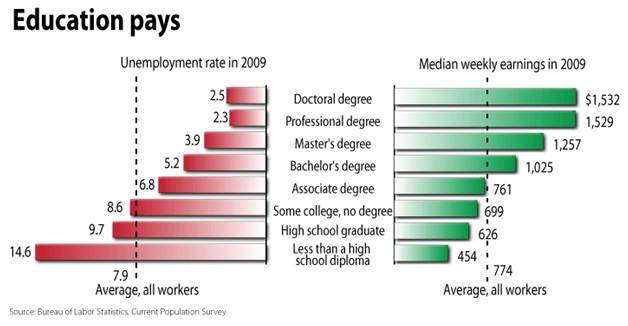 Studies show that education pays off in terms of employment and earnings. The graph above demonstrates that there is a strong positive correlation between education and income; and a strong negative correlation between education and unemployment. In order words, a person with a higher education, on average, will have higher earnings, and less probability to be unemployed then a person with a lower education. The statistics displayed above are true, on average, for the entire population. However, do these same statistics apply for people with dyslexia? I remember reading in the past a UK study that claimed that the gap of unemployment between a person with dyslexia and without dyslexia rises with increased education (sorry – could not find the link of the study – if anyone can help let me know). In many ways these findings make sense. Dyslexics receive support from their families and teachers and government aid during their school years, to ensure their academic success. But, once they leave the school gates, they are usually left alone with their reading and writing disability. In many countries there is already a high awareness to learning disabilities and dyslexia, with government aid being offered (e.g. Individuals with Disabilities Education Act (IDEA)). These government intervention projects provide proactive aid to dyslexic students to graduate from high schools and universities. However, there is minimal or no official support offered to graduating dyslexics, promoting those same people who were aided in schools, to obtain and maintain a job. This information presents a real challenge for educators and decision makers. In order to help people with dyslexia to succeed in life, on one hand education assistance is required. But on the other hand proactive aid should be offered assisting a dyslexic to obtain and maintain a job. Only then can education really pay off for dyslexics too.